2009 • 320 pp. 40 illus. 6 x 9 1/4"
In this, the first in-depth study of the most American of holidays, James Baker sweeps away lingering myths and misconceptions to show how this celebration day was born and grew to be an essential part of our national spirit. 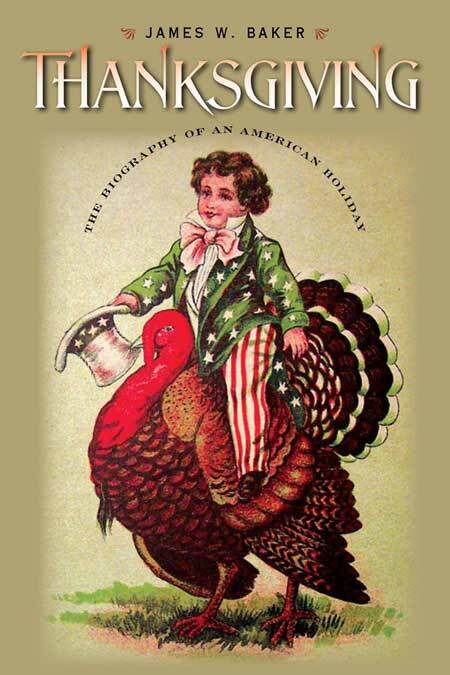 Thanksgiving: The Biography of an American Holiday opens with an overview of the popular mythos of the original holiday before discussing its possible religious and cultural precedents. This classic Yankee holiday is examined in historical and contemporary detail that covers everything from proclamations, sermons, and local and regional traditions to family reunions, turkey dinners, and recipes. The changing face of the holiday is illustrated with charming and often revealing period prints that chart our changing attitudes: the influence of Victorian sentiment in Thanksgiving’s development, Progressive utilitarianism, intellectual “debunking,” patriotic wartime reclamation, and 1960s-era protest. All these topics are examined, showing how a holiday’s meaning shifts and morphs over historical periods. Thanksgiving remains controversial up to the present day, as Mayflower descendants, Native Americans, and commercial exploiters compete for the American public’s opinion of the holiday’s contemporary significance and its future status. This is an intelligent and illuminating introduction to a beloved holiday and a fascinating cultural history of America and Americana. For a preview of the book, see the sample chapters links at the head of this page.